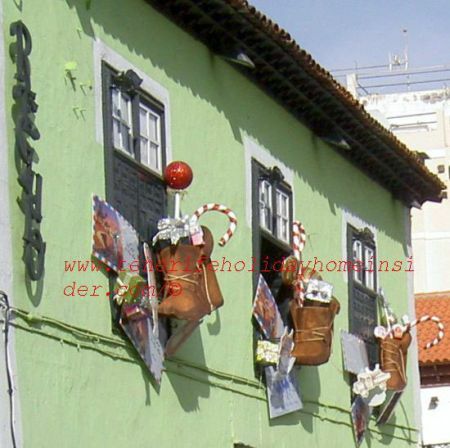 What makes Tenerife Christmas window decorations special? It's interesting to track Christmas window decorations over several years. We did that with those of the Tenerife restaurant 'Restaurante el Regulo'. 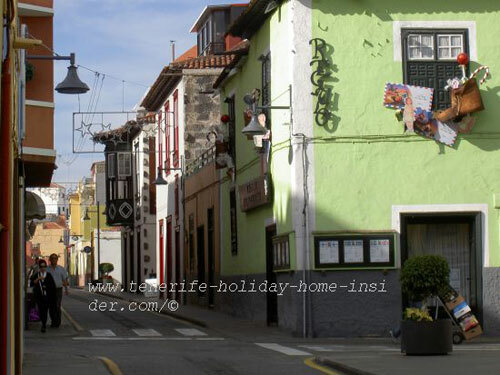 You can find it just behind the Puerto de la Cruz main town square by the street C/San Felipe. Restaurant Restaurante Regulo village scene in Puerto de la Cruz in Tenerife Spain. Actually, behind it stretches the fancy restaurant mile of Puerto de la Cruz which is called 'la Ranilla'. Why so much effort for Christmas window decorations? The theme emphasizes that this is a company where not only the quality of food is important. The owners want to make you feel at home during the festive season. You mustn't miss a white Christmas. Air mail envelopes are depicted together with the boot of Christmas presents. This is a message that the restaurant owners appreciate those letters very much. They kept them and now they are displayed as a token of gratitude. Overseas customers have sent them. No doubt, many expressed their pleasure for a merry Tenerife Christmas at the Regulo premises. So much to the outstanding Christmas theme of Tenerife North by Regulo of 2012/2013. 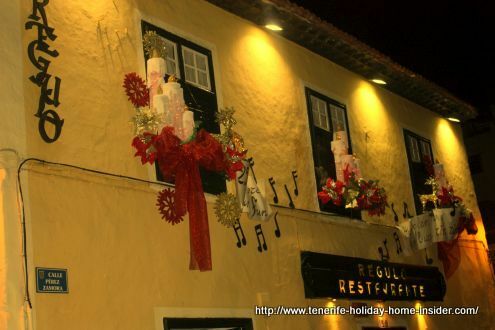 Above, Christmas outside decorations give you the theme of the year 2011/2012 by Restaurante el Regulo, as they are portrayed with three in a row of the restaurant's top floor. Again, unity is what counts. This is a perfect way to enhance windows with Christmas decor. By the way the year after brought a decorating surprise. Led lights were used. They featured a Christmas sleigh made with special lights, if I remember well. They have been the craze for quite a while. However, I was very disappointed and didn't make any photos of this display. 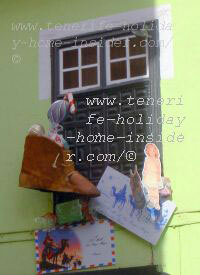 This is the modern way of adorning house facades and windows, any time of the year. This is not individual any more. Too many use the same ornaments which are bought. There is nothing artistic or creative about it, unless used together with a basic very personal decoration. Back from Christmas window decorations to outside Christmas decorations of the same Regulo Restaurant of Puerto de la Cruz. Want to know more about Puerto Cruz which is the oldest Tenerife resort ? Here is a Christmas poem to round off the holiday decor.